in that good days playing MIDI music was the only alternative for PC maniacs who doesn't own a CD Drive (which itself) was another luxury and even thouse who had a CD ROM device, were mainly playing music in CD audio format (.CDA). Anyhow MIDI was a cheap and a CPU unintensive way to listen to equivalent of favourite popular Audio Songs and for those who still remember many of the songs were recreated in MIDI format, just with a number of synthesized instruments without any voice (as MIDI is usually). The same was true also for the good old days of raise of Mobile Phones, when polyphonic was a standard as CPU power was low MIDI was a perfect substitute for the CPU heavy Encoded MP3s / OGG and other formats that required a modern for that time Intel CPU running in 50+ Mhz usually 100 / 166Mhz was perfect for the days to play Mp3 but still even on that PCs we listened to Midi songs. Therefore if you're one of those people like me who still enjoy to play some Midi Music in the year 2017 and feel a bit like Back into the Future movie and a Free Software fan and user, especially if you're a novice GNU / Linux Free Software user, you will be unpleasently surprised that most today's default Linux distributions doesn't have an easy way to play Midi music format out of the box right after install. How to make MIDI easy listanable in Linux graphical environment like GNOME / KDE / XFCE desktop ? Необходимо е да се изтеглят 6754 B архиви. След тази операция ще бъде използвано 35,8 kB допълнително дисково пространство. Selecting previously unselected package vlc-plugin-fluidsynth:amd64. 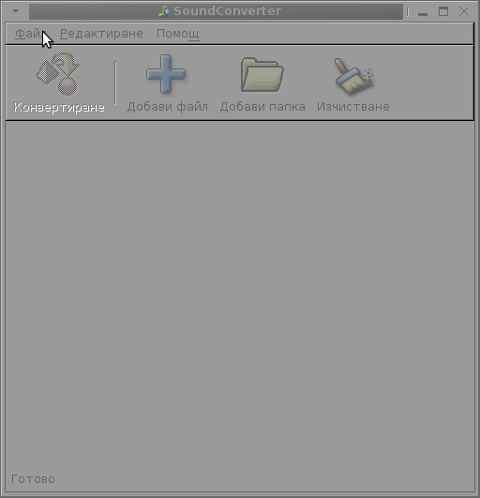 Besides making your MIDI play on the GUI environment easy as a a point and click VLC will also be able to play MIDIs on GNU / Linux from your favourite browser (nomatter Firefox / Chrome or Opera), even though the player would play in a new PopUP Window it is easy to select once MIDI file from a random website for example – here is a directory listing of Webserver with Doom II Soundtrack in MIDI format , click over any file from list and Choose option for VLC to always remember that MIDI files has to be opened with VLC player. What if you have stumbled on an old website which was configured with very OLD HTML Code to play some nice music (or even different MIDI songs) for each part of the website (for each webpage) and you want to have the Websites created with embedded MIDIs to automatically play on Linux oncce you visit the site? 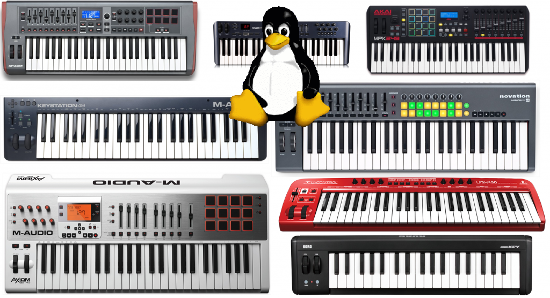 But with a couple of tunings as usual GNU / Linux can do almost everything, so here is how to enable embedded browser support for Midi on Linux (That should work with minor modifications not only on Debian / Ubuntu / ArchLinux but also on Fedoras, CentOS etc. 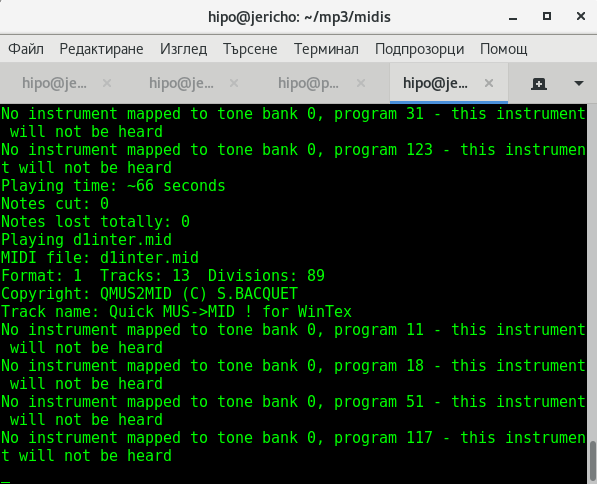 If you try it on any of this distributions, please drop a short comment and tell me in few lines how you made embedded midi worked on that distros. # repeat swallow(documentShell) fill: acroread -geometry +9000+9000 +useFrontEndProgram "$file"
repeat noisy swallow(Xpdf) fill: xpdf -g +9000+9000 "$file"
repeat noisy swallow(gv) fill: gv –safer –quiet –antialias -geometry +9000+9000 "$file"
Необходимо е да се изтеглят 0 B/580 kB архиви. След тази операция ще бъде използвано 0 B допълнително дисково пространство. A remark to make here is timidity is quite CPU intensive, but on modern Dual and Quad-Core PC Notebooks, the CPU load is not of a big concern. For details please see the file COPYING. Even though I tried hard to resolve that error by loading various midi related MIDI modules and following a lot of the suggestions online on how to make /dev/sequencer work again it was all no luck. Anyhow on some other Linux distributions (especially with Older Kernel versions), some of the above 3 suggested Fix might work perfectly fine so if you have some time give it a try please and drop me a comment on how it went, you will help the GNU / Linux community out there that way. Now back to where I started timidity even though it will play fine it will not give any indication on the lenght of the midi song (precious information such as how much time is left until the end is over). Need to get 5814 kB of archives. After this operation, 21.0 MB of additional disk space will be used. Selecting previously unselected package muse. 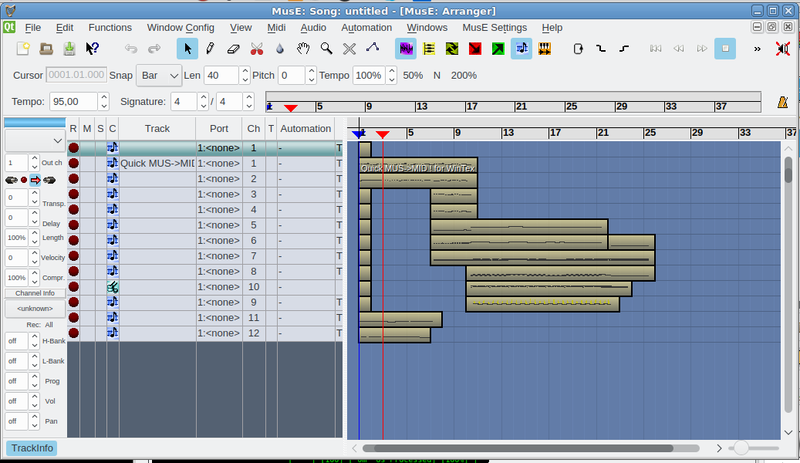 MusE is a MIDI/audio sequencer with recording and editing capabilities. 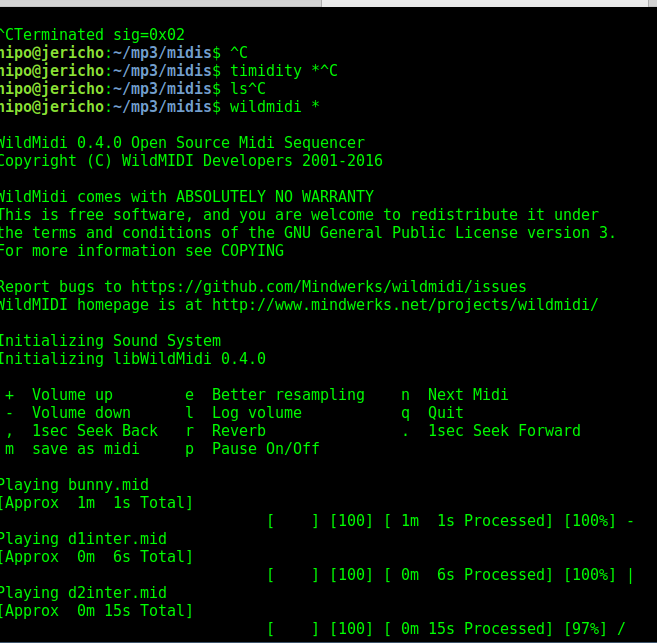 * Standard midifile (smf) import-/export. * MIDI editors: pianoroll, drum, list, controller. * Score editor with high quality postscript printer output. * Realtime: editing while playing. * Unlimited number of open editors. * Unlimited number of tracks. * Sync to external devices: MTC/MMC, Midi Clock, Master/Slave. * Audio tracks, LADSPA host for master effects. * Uses raw MIDI devices. * Project file contains complete app state (session data). * Application spanning Cut/Paste Drag/Drop. 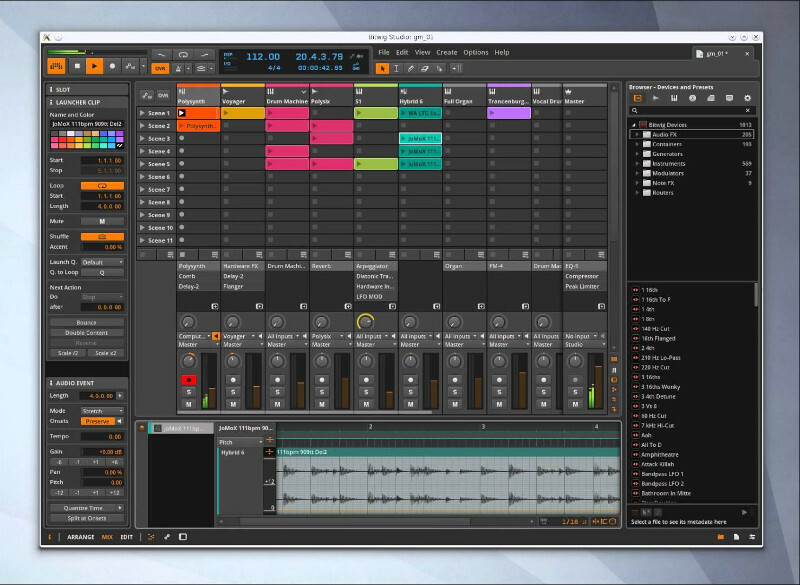 bitwig – Bitwig Studio is a multi-platform music-creation system for production, performance and DJing, with a focus on flexible editing tools and a super-fast workflow. Well, that's all folks now enjoy your MIDIs and don't forget to donate, as I'm jobless at the moment and the only profit I make is just a few bucks out of advertisement on this blog. If you're a Linux user and you have to write some scripts for websites to extract all Images /Pictures from Microsoft Word .docx document then you'll probably wonder if there is a (Linux) command-line tool to extract all the images from a MS Word .docx document? For websites or even for scripting purposes extracting .docx on Linux / UNIX OS is really a great thing to do. The good news is MS .docx format is simply a ZIP Archive file format, so you can straight away unzip and pick up all the contained image .JPG / .PNG / .GIF whatever Graphic files bundled. As you can see from above output .docx files media files are always stored under "word/media/*" file structure folder. [root@centos ~:]# unzip your-file-name-of-choice.docx "*.jpeg"
[root@centos ~:]# unzip your-file-name-of-choice.docx "*.xml"
If you need to extract pictures from older .doc (2003) MS file format you will first need to convert .doc file to .docx and then you can use unzip to extract the files you need. 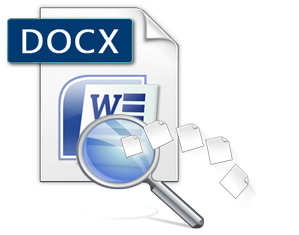 Unfortunately I'm not aware how to convert .doc to docx with a tool if somebody knows share in comment. Perhaps it is possible with unoconv or abiword. I’ve used K3B just recently to RIP an Audio CD with music to MP3. K3b has done a great job ripping the tracks, the only problem was By default k3b RIPs songs in OGG Vorbis (.ogg) and not mp3. I personally prefer OGG Vorbis as it is a free freedom respecting audio format, however the problem was the .ogg-s cannot be read on many of the audio players and it could be a problem reading the RIPped oggs on Windows. 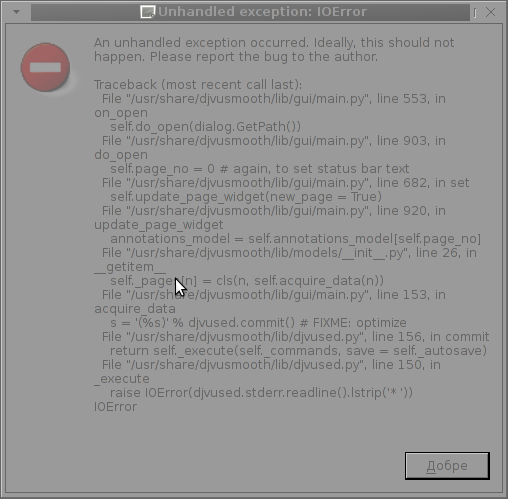 I’ve done the RIP not for myself but for a Belarusian gfriend of mine and she is completely computer illiterate and if I pass her the songs in .OGG, there is no chance she succed in listening the oggs. I’ve seen later k3b has an option to choose to convert directly to MP3 Using linux mp3 lame library this however is time consuming and I have to wait another 10 minutes or so for the songs to be ripped to shorten the time I decided to directly convert the existing .ogg files to .mp3 on my (Debian Linux). There are probably many ways to convert .ogg to mp3 on linux and likely many GUI frontends (like SoundConverter) to use in graphic env. I however am a console freak so I preferred doing it from terminal. I’ve done quick research on the net and figured out the good old ffmpeg is capable of converting .oggs to .mp3s. To convert all mp3s just ripped in the separate directory I had to run ffmpeg in a tiny bash loop. The loop example is in bash so in order to make the code work on FreeBSD it is necessery it is run in a bash shell and not in BSDs so common csh or tcsh. 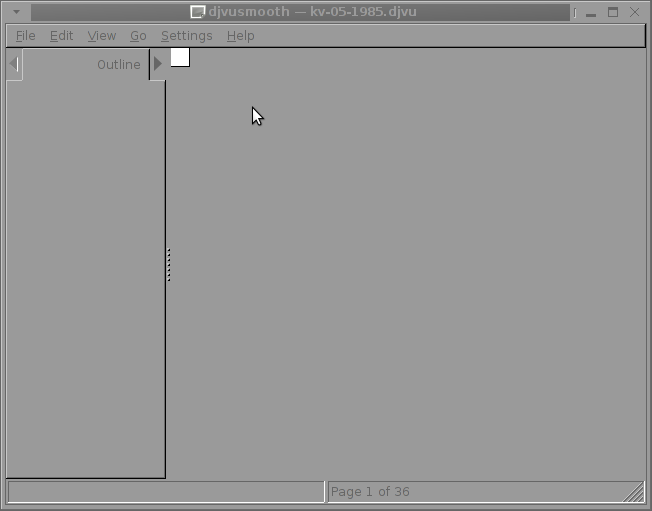 By default there is no way to see what is inside a DJVU formatted document on both Windows and Linux OS platforms. It was just a few months ago I saw on one computer I had to fix up the DJVU format. 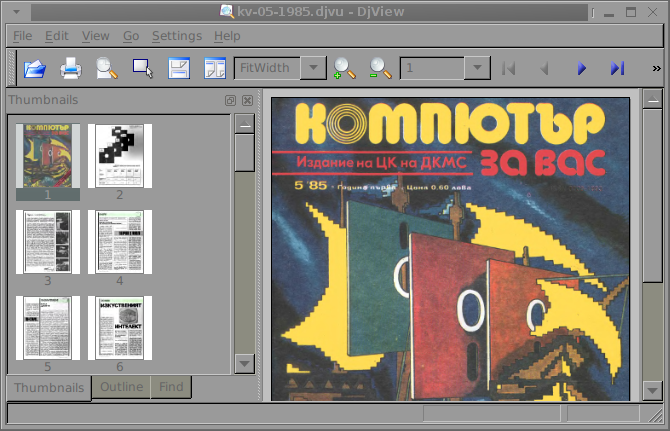 DJVU format was developed for storing primary scanned documents which is rich in text and drawings. Many old and ancient documents for example Church books in latin and some older stuff is only to be found online in DJVU format. The main advantage of DJVU over lets say PDF which is also good for storing text and visual data is that DJVU's data encoding makes the files much more smaller in size, while still the quality of the scanned document is well readable for human eye. DJVU is a file format alternative to PDF which we all know has been set itself to be one of the major standard formats for distributing electronic documents. Besides old books there are plenty of old magazines, rare reports, tech reports newspapers from 1st and 2nd World War etc in DJVU. A typical DJVU document takes a size of only lets say 50 to 100 KBytes of size just for comparison most a typical PDF encoded document is approximately sized 500 KiloBytes. WinDjView is licensed under GPLv2 is a free software licensed under GPL2. WinDjView works fine on all popular Windows versions (7, Vista, 2003, XP, 2000, ME, 98, NT4). I've made a mirror copy of WinDjView for download here (just in case something happens with the present release and someone needs it in future). The library capable of rendering DJVUs in both Linux and Windows is djviewlibre again free software (A small note to make here is WinDjView also uses djviewlibre to render DJVU file content). The program that is capable of viewing DJVU files in Linux is called djview4 I have so far tested it only with Debian GNU / Linux. Desktop FreeBSD users and other BSD OS enthusiasts could also use djview4 to view DJVUs as there is a BSD port in the ports tree. To sum it up obviously DJVU seems like a great alternative to PDF, however its support for Free Software OSes is still lacking behind. The Current windows DJVU works way better, though hopefully this will change soon. I have a bunch of old html files all encoded in the historically obsolete Windows-cp1251. Windows-CP1251 used to be common used 7 years ago and therefore still big portions of the web content in Bulgarian / Russian Cyrillic is still transferred to the end users in this encoding. 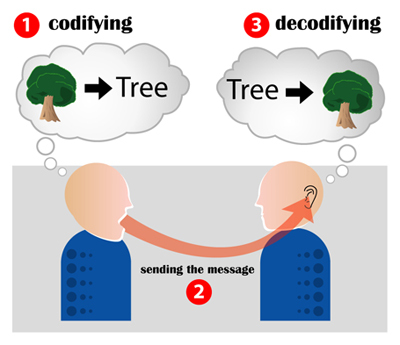 Well it was clear the specific national country text encoding standards will quickly be moved by to UTF-8 – Universal Encoding format which abbreviation stands for (Unicode Transformation Format). The result for the system administrator is always a mess – a lot of webpages that are showing like unreadable signs and tons of unhappy customers. As always the system administrator is considered responsible, for the programmer mistakes :). So instead of programmers fix their bad cooking, the admin has to fix it all! Though this mostly would, work there are some occasions, where only a particular html files from all the content served by Apache is encoded in windows-cp1251, if most of the content is already written in UTF-8, this could be a big issues as you cannot just change the UTF-8 globally to windows-cp1251, just because few pages are written in archaic encoding…. Since most of the content is displayed to the client by Apache (as prior explained) just fine, only particular htmls lets's ay single.html, single2.html etc. etc. 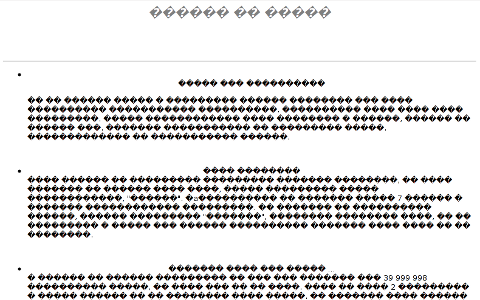 are displayed with some question marks or some non-human readable "hieroglyphs". I always, make copies of the original cp1251 encoded files (as you see mv single1.html single1.html.bak), because if something goes wrong with convertion I can easily revert back. I'm starting to learn some video editing, as I need it sometimes for building client websites. 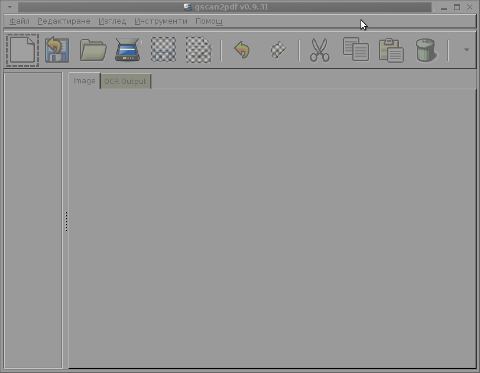 As a Linux user I needed to have some kind of software for amateur video editing. For Microsoft Windows OS, there are tons of video editor programs both free and proprietary (paid). Windows users can for instance use the free software program VirtualDub (licensed under GPL license) to easily cut movie scenes from a video. Unfortunately VirtualDub didn't have a Linux or BSD version so in my case I had to look for another soft. I consulted a friend of mine who recommended a video editor program called LiVES. LiVES can extract only sound from videos, cut selected parts (frames) from videos and do plenty of other nice stuff. It is just great piece of software for anyone, who needs to do simply (newbie) video editting. To master the basics and edit one video in FLV format it took me about 1 hour of time, as in the beginning it was confusing to get confortable with the program scenes selector. One downside of LiVES it failure to open a FLV file I wanted to edit. In order to be able to edit the flv movie hence I first had to convert the FLV to AVI or MPEG, as this two (video multimedia formats) are supported by LiVES video editor. 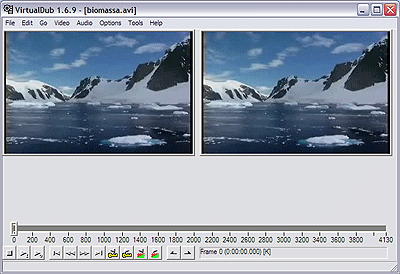 After completing my video scenes chopping to the AVI file I had to convert back to FLV. 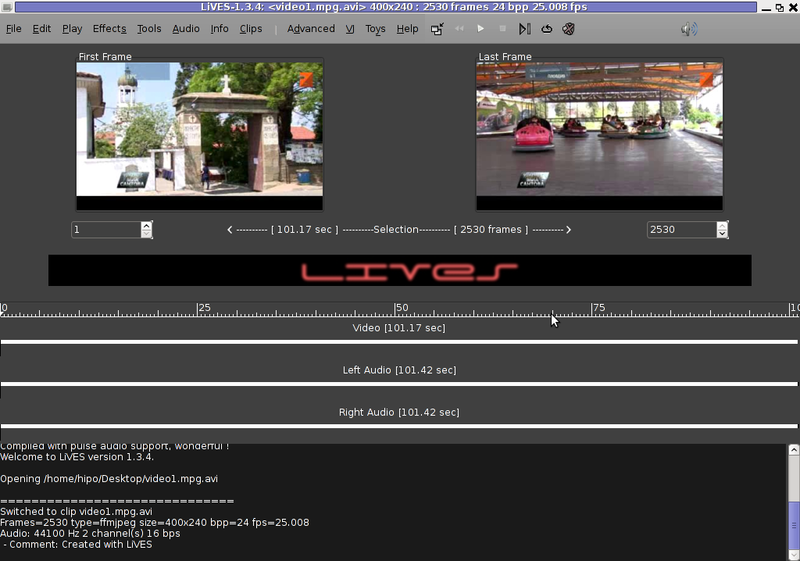 Avidemux has a nice GUI interface and also like Lives has support for video editting, though I have never succesfully done any video edits with it. Avidemux IMHO is user (completely intuitive). To convert the FLV to AVI, all I had to do was simply open the file FLV file, press (CTRL+S) select my FLV video file format and select the output file extension format to be AVI. Further on, used LiVES to cut my desired parts from my video of choice. Once the cuts were complete I saved the new cutted version of video to AVI. Hope this article helps someone aiming to do basic video editting on Linux with LiVES and just like needed FLV to AVI and AVI to FLV convertions. 1. 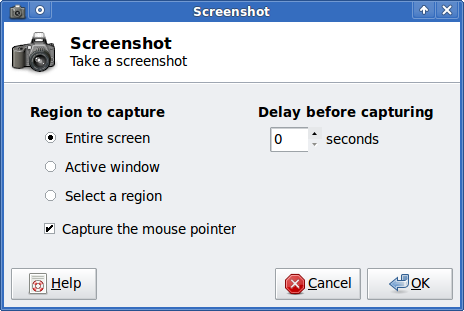 Install the slackware binary package xfce4-screenshooter. By the way, I haven't used slackware for a long time so in the mean time since Slackware 13, the default slackware packages format .tgz is now substituted with the newer .txz (better compressed .txz). The old .tgz was simply a tar archive with DEFLATE gzip. The newer .txz packages bundled with newer slackware releases are using the LZMA2 (XZ) chain algorithm for compression. LZMA implies higher compression than even bzip2 and this is the reason why Patrick Volkerding – the one man army man behind Slackware decided to use it. The reason Vollerding choose using .txz is slackware network distribution will load up less the networks and will take less time for downloading extra slackware packages via the internet. The .txz also reduces slackware main CD size so more packages can be contained in the same 700MB sized slack install CD. 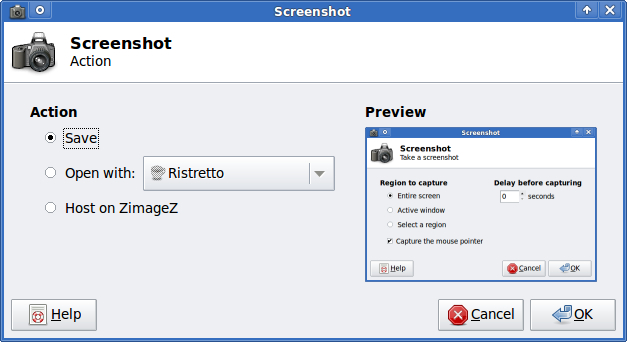 Anyways now back to the installation of xfce-screenshooter.